Information about horse: Rae Rae is such a lovely horse to be around. 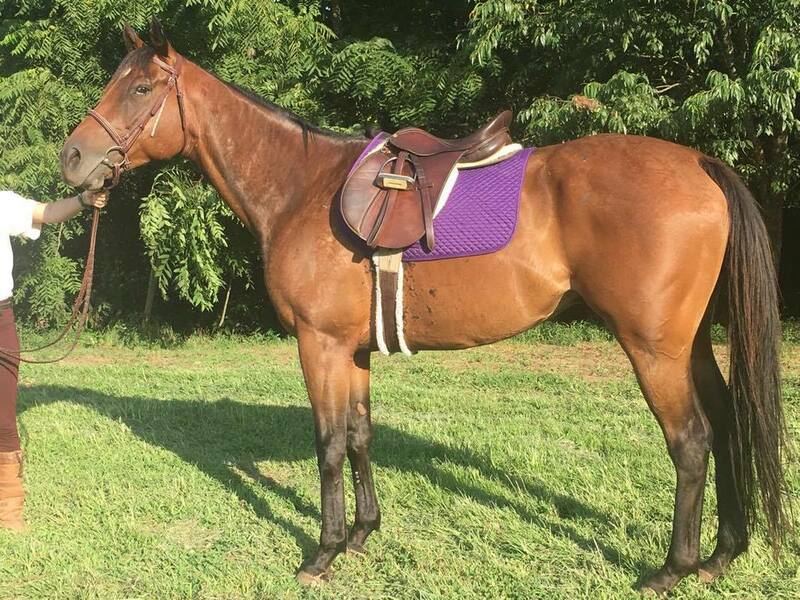 This handsome gelding has tons of personality and wants to be in your pocket. He is the first one to the gate and loves attention. Retired in 2014 from a sesamoid injury was given plenty of down time at our Turning for Home Partner Farms to heal. He has been riding and pasture sound and going well under saddle. Rae has and old scar on his side from and injury at the track you can see in the pictures. With proper fleece protection we have found that Rae can be ridden english or western. This handsome man is currently riding barefoot under saddle and is on 24/7 turnout. He will move nicely off of your seat and leg so I would not suggest a him for a beginner without supervision but someone who wants a fun uncomplicated mount to hack out on the trails, do some local open showing, or dressage with Rae is your man. Special consideration will be given to a forever home for Rae Jet. PPE's are always welcome at the adopter's expense. If you are interested in him please fill out an application by clicking on the "Inquire about this horse link below."